Roughly every two years Mars and Earth wander a bit closer to each other, making the leap between these two planets a little easier. In July this year, Mars will only be about 58 million kilometres away – and NASA is set to take advantage by launching their next mission to the red planet in May 2018. 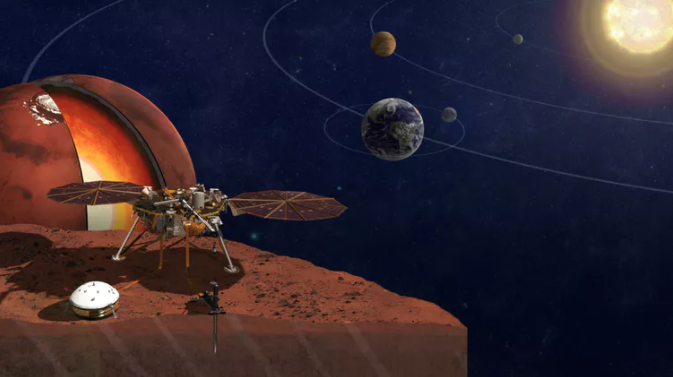 The InSight Lander, will be the first Mars mission to investigate the planet’s “inner space”, and will listen for marsquakes to investigate the crust, mantle, and core. InSight will join two rovers currently exploring the surface of Mars, and 14 spacecraft that are in orbit about it – albeit only six of which are currently sending us data. Why does Mars, the red planet, have such a hold over us? There are, after all, seven (or eight) other planets to explore – and yet we seem to have such a hang up on this one. I guess it’s the tantalising nature of Mars. Here is a planet that we could conceivably walk on (unlike the gas giants), without being crushed by atmospheric pressure (like on Venus), having to deal with the radiation of being closer to the sun (Mercury) or just being far too far away (like Pluto). It calls to us through science fiction and fact, a planet that is so like our own Earth, but so unlike it at the same time. The six current operational missions show that the fascination with Mars isn’t limited to one country, as European, Russian, American and Indian space agencies all have stakes in these crafts. For comparison: our other nearest neighbour, Venus, only has one spacecraft currently in orbit about it, Akatsuki the spacecraft that wouldn’t quit. In fact, after the dramatic ending of the Cassini spacecraft, the only other planet currently being orbited by an Earth-built satellite is Jupiter, with the Juno mission. But, while our progress to walking on Mars has been very slow, our progress in understanding our neighbour has been really quite impressive. When I started my planetary science degree in 2001, the course did not include sedimentology, the branch of geology that investigates how water has shaped rocks. It was deemed there was no point as no water has been seen on any other planet. By the time I was in third year, the first years students behind me were getting well versed in how water could push around sand, silt and clay on other planets. Finding water on Mars had been an obsession to many, and thanks to data from Mars rovers Spirit, Opportunity and latterly Curiosity we know that it’s there – just trapped in the rocks. A couple of years ago it was thought that we had even found water flowing on the surface of Mars, but that evidence is (ahem) drying up now. However, whether the water flows or is trapped in the rocks, the next question is where is the rest of it? If many of the rocks we see on Mars had been laid down by water – where is that water now? The answer would be tangled up with the fate of Mars’s atmosphere. Though pitifully thin now, it must have been thick enough in the past to support flowing water on the surface. The mission of the spacecraft Maven (along with others) has been investigating this question – and all evidence is pointing to the Sun as the culprit for Mars’ missing atmosphere, with the solar wind gradually stripping it away. It’s often touted that we know more about the surface of Mars than we do the bottom of our own oceans – and in terms of mapping resolution that’s true. Through the efforts of four orbiting missions we know how old most of the surface is, as well as how active it has been. You can spend a joyful afternoon of procrastination flitting through HiRISE images that show sweeping dunes and pock-marked plains on Mars. With these images we can really apply our understanding of processes on Earth to what makes up the surface of Mars – from the formations of geological features, the movement of dust and sand and how the ice caps change through the seasons. So we know there is water on Mars, we know where its atmosphere went and also the shifts of its sands – but there’s a missing piece of the puzzle. What’s on the inside? To be fair, in this respect the interior of our own Earth is just as much of a mystery – but we have had centuries of seismic studies. From monitoring the passage of earthquakes through our planet we have built a picture of the layers that make up its interior. From that we’ve been able to undertake experiments that recreate the conditions and add more to that picture. At the moment we can only guess at the conditions within the interior of Mars – something that the InSight mission will answer. After this, the next hurdle will be getting something back from Mars. We have a handful of meteorites that we know came from Mars, but having a sample that’s been collected and returned from a known location will priceless. NASA’s next rover, Mars 2020, will plan to do just this – but the return to Earth bit is still to be worked out. From sample return to human exploration is still a massive step, and will require a number of innovations to get there. But with the knowledge we’ve built from the missions over the last decade, it’s becoming more of a reality. Image: An artist’s rendition of the InSight lander – which will collect data on what’s inside the planet Mars.